Since writing my first post about miniature eye portraits (September 2008) or "Lovers Eyes" as they are often called, I have managed to get even a bit more obsessed with them, and even succeeded in finding one for my very own (above) via Tail of the Yak in Berkeley, one of my favorite sources for inspiring things. Last year I started restoring a family collection of miniature portraits and have spent many hours looking closely at how they were painted. I like to paint at very large scale, and in so doing I closely examine and celebrate details and moments in paintings that would otherwise just be accents. Perhaps because of this examination, these intimate little gems really enthrall me, and I have been researching the techniques involved in creating them. Usually miniature portraits were painted with gouache or watercolor on ivory, and later cellulose nitrate, also known as ivorine. 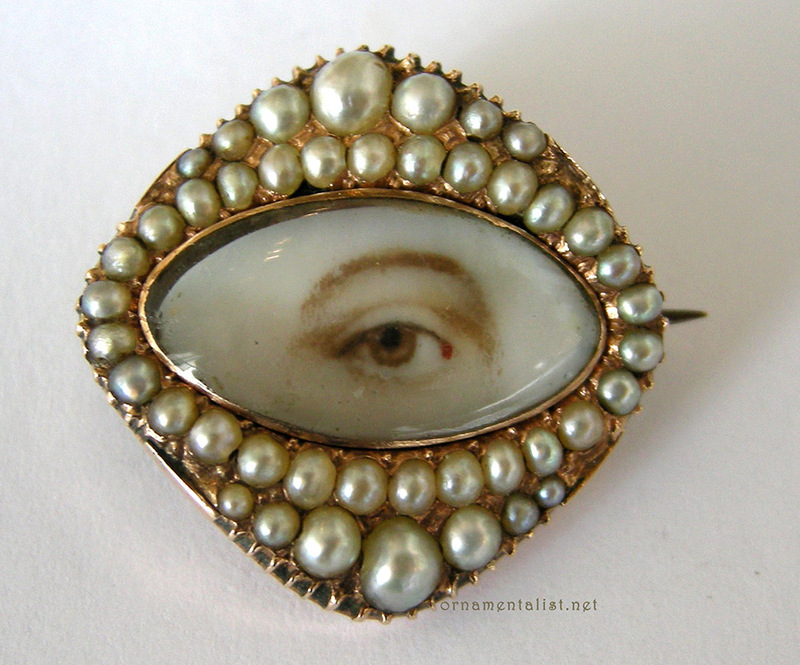 Lover's eyes were nearly always mounted into jewelry: pins, pendants, and sometimes rings. Mourning jewelry sometimes took this form as well. In my research I found a number of artists from the 20th century who were working in this medium, as well as contemporary artists who are reviving this art in their own fashion. 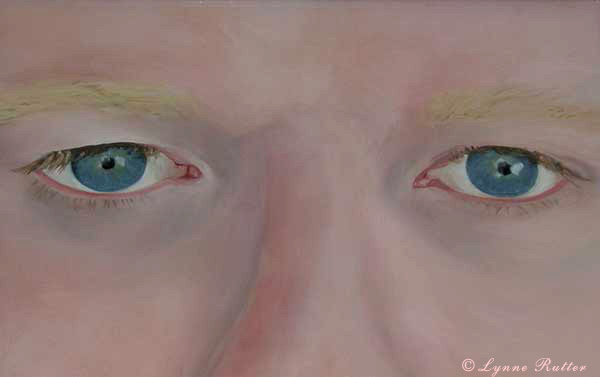 Tabitha Vevers has painted some beautiful lover's eyes based on portraits by Simon Martini, Ingres, and even Man Ray. 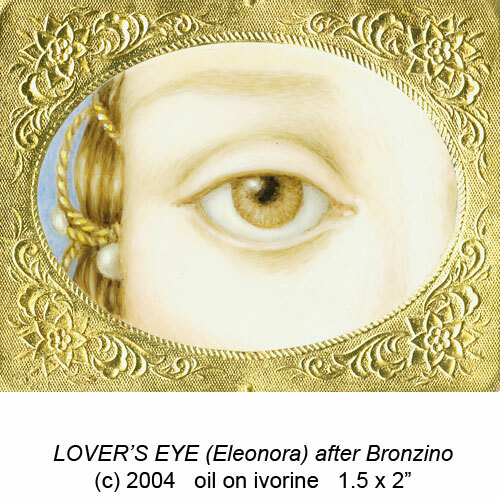 The image at left is one of Vevers' lover's eye miniatures, painted in oils after a Bronzino portrait. 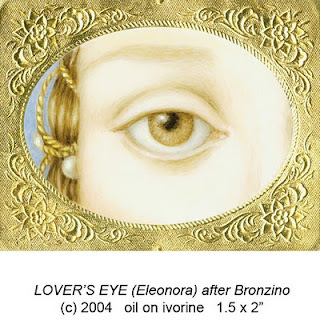 Mona Connor has recently started a series of miniature eye portraits using egg tempera, and has even started a blog about this project. I might continue to work larger than life, but I am so inspired by these tiny tributes, and the methods used to create them, that I may be launching a new project of my own soon. Well, you know how I feel about this subject! More,please!!! Great post Lynne. This is exquisite! And I do think you are onto something in delving into miniature eye portraits further. I just discovered that we are in the same part of the world so I will be making my way to Berkeley to see Tail of the Yak.